Last year, following the firing of James Comey, Deputy Attorney General Rod Rosenstein discussed rallying cabinet members to remove Trump from office — by invoking the 25th Amendment — and suggested he secretly record the president in the White House in an effort to "expose the chaos consuming the administration," New York Times' Adam Goldman and Michael S. Schmidt report. 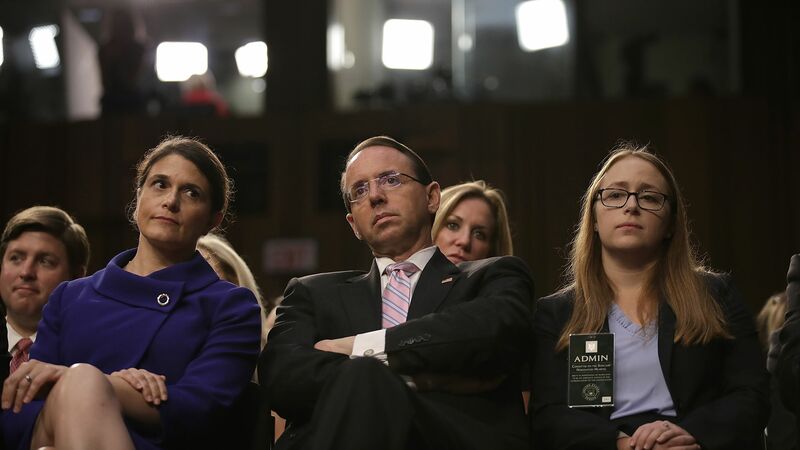 Between the lines: It is not clear how serious Rosenstein was about his plans. The idea to wear a wire when interviewing potential FBI directors with President Trump was never acted upon, according to the Times. Rosentstein reportedly told former deputy FBI director Andrew McCabe that he believed he could get Attorney General Jeff Sessions and then-Homeland Security Secretary John Kelly on board in an effort to remove Trump from the presidency. Trump cited a memo Rosenstein wrote critiquing former FBI Director James Comey's handling of the Clinton investigation as reasoning behind his decision to fire Comey. Afterward, Rosenstein told people he had felt used, per the Times. Rosenstein disputed the Times' story calling it "inaccurate and factually incorrect" in a statement provided to the news agency. He added, "let me be clear about this: Based on my personal dealings with the president, there is no basis to invoke the 25th Amendment." A Justice Department spokesperson sent a statement to the Times from someone who had been in the room when Rosenstein suggested wearing a secret recording device to an interview with Trump said that it was mentioned in a sarcastic manner. "I never pursued or authorized recording the President and any suggestion that I have ever advocated for the removal of the President is absolutely false," reads a Justice Department statement on behalf of Rosenstein sent to Axios. Editor's note: This story was updated with Rosenstein's latest statement.